For many years a common media meme has been that black people have to be Democrats and that African-Americans whose political views are even slightly right of center must either be addle-minded or crazy. Janeane Garofalo in her disgusting interview with MSNBC's Keith Olbermann last month said anybody at April's Tea Parties that wasn't white had to be suffering from Stockholm Syndrome. On Friday, Barbara Howard, a black, Republican media and government relations consultant from Florida, took on this absurd stereotype -- "I dare say that Miss Garofalo knows little or nothing about black folk and definitely not black Republicans" -- while claiming President Obama "thinks he knows more than everybody, including all 43 presidents before him." 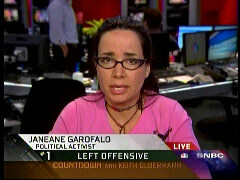 Comedienne and liberal activist Janeane Garofalo caused quite a stir last month when she called Tea Party goers "a bunch of teabagging rednecks," adding "this is about hating a black man in the White House. This is racism straight up." On May 8, Fox News correspondent Griff Jenkins happened upon Garofalo at a Starbucks in Boston, and asked, "What do you think of calling just honest protesters racists?" Garofalo wasn't backing down or apologizing: "Well, because they're not just honest protesters. They were indeed motivated a lot by racism." 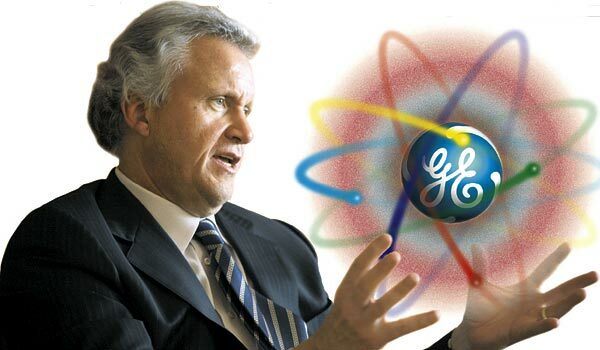 UPDATE: Audio of crowd booing GE CEO available here. General Electric held its annual shareholders meeting Wednesday, and attendees apparently were very upset with the increasing leftward tilt of MSNBC. According to the Hollywood Reporter, during the question and answer phase of the meeting, shareholders repeatedly brought up the company's far-left leaning network, and often had their microphones turned off as a result. The media coverage of the more than 800 Taxed Enough Already (TEA) Party protests that took place in all fifty states on April 15 ranged from disdainful dismissal of their nature, significance and import, to outright hostility towards the events and individual participants, to sexual innuendo-based full-on ridicule. In this summary, we focused on the three major networks - NBC, ABC and CBS, the two left-of-center cable news networks - CNN and MSNBC and the three major "national" newspapers - the USA Today, the New York Times and the Washington Post. While not an exhaustively comprehensive oeuvre of TEA Party bias, it contains many, many examples which serve to illustrate the broader antipathetic themes. Count CNN's Lou Dobbs amongst the likely millions of Americans disgusted by Janeane Garofalo's vitriolic attacks Thursday when she claimed the previous day's Tea Parties "were about hating a black man in the White House. This is racism straight up. That is nothing but a bunch of teabagging rednecks." On his radio program Friday, Dobbs took issue with the actress, comedian, and activist, referring to her as a "nasty piece of business," " a one woman, you know, hate event," and "an appalling human being." Dobbs also pointed fingers at the network responsible for this disgraceful broadcast, MSNBC, for thinking "their responsibility as a media is to be a conduit for the Obama administration. They think they are the bastion of the, the 21st century socialistic thought. They're as left-wing as it can get, and they apparently are hell-bound to be the conduit for the Obama administration, the venue for left-wing politics and zaniness in this country." Here, however, is an edited video (matching MP3 audio), just over two-minutes in length, of her most-outrageous smears uttered on the April 16 program. During last year's election campaign, liberal media members treated Republican vice presidential candidate Sarah Palin with a hatred most Americans had never witnessed from the press. On Thursday's "Countdown," MSNBC's Keith Olbermann and his guest Janeane Garofalo defamed fellow citizens who attended the prior day's Tea Parties with the same vitriolic contempt. Garofalo actually called Party-goers "a bunch of teabagging rednecks," adding "this is about hating a black man in the White House. This is racism straight up." 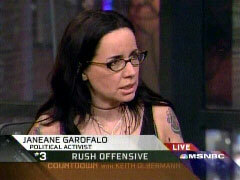 On Monday’s Countdown show, MSNBC’s Keith Olbermann hosted left-wing actress and comedian Janeane Garofalo to discuss FNC analyst Bernard Goldberg’s recent enumeration of the "five worst offenders" of what Bill O’Reilly called the "far-left smear machine,"and Garofalo took the opportunity to paint conservatives as angry racists who inspire violence from some of their non-intellectual followers. Garofalo: "The right wing has a way of always having an enemy, whether it be immigrants or Arabs or brown-skinned people, black-skinned people, homosexuals, women. They all, kind of, rally around an enemy, an other, that they can get mad at. And death does occur." After accusing conservative activist Grover Norquist of "handing out talking points" to a "right-wing machine," and after mentioning former Vice President Cheney’s recent contention that President Obama’s policies would endanger the nation’s homeland security, Garofalo called the "personality type" that she claimed motivates some non-intellectual conservatives a "scourge" and an "unfortunate part of our society." Garofalo: "A lot of the people in the right-wing base are not the most intellectual people in the world, not the most savvy people in the world, and they are definitely quick to anger, and quick to blame other people. ... it's a very sad, sad thing, and it's part of the human nature of a personality type that tends to identify as Republican or conservative. And it's an unfortunate part of our society. It's a scourge on our society." Olbermann concurred: "It is, indeed."